Critique of The Situationist International by Gilles Dauve (Jean Barrot) is one of the more important texts on the situationists.We reprint below an update to the text which is due to be published in Greek by TPTG. In the year 2000, "society of the spectacle" has become a trendy catchphrase, not quite as famous as "class struggle" used to be, but socially more acceptable. Moreover, the SI is now obscured by its main figure, Guy Debord, who is currently portrayed as the last romantic revolutionary. In Berlin as in Athens, one has to go beyond situationist fashion in order to assess the SI's contribution to revolution. In the same way, one has to tear the "marxist" veil to understand what Marx actually said and what he still means to us. Are these banalities? Well, they weren't always, and still aren't for everyone. We have only to read the Principles of Communist Production & Distribution,1 written in 1935 by the Dutch-German Left, to realize the scope of the evolution. As for Bordiga and his successors, they always regarded communism as a program to be put into practice after the seizure of power. Let's just remember what was talked about in 1960, when radicals debated about "worker power" and defined social change as an essentially political process. Revolution is communization. This is as important, for example, as was the rejection of the unions after 1918. We're not saying that revolutionary theory ought to change every thirty years, but that a sizable proletarian minority rejected the unions after 1914, and another active minority aimed at a critique of everyday life in the 60s and 70s. The SI superseded the boundaries of economy, production, workshop and workerism because, at the time, from Watts to Turino, proles were actually questioning the work system and extra-work activities. But the two fields rarely came under attack from the same groups: Blacks would riot against the mercantilization of ghetto life, while black and white workers would rebel against being reduced to cogs in the machine, yet the two movements failed to merge. On the shopfloor, workers rejected work on the one hand, and asked for higher wages on the other: wage-labour itself was never done away with. However, there were attempts to question the system as a whole, in Italy for instance, and the SI was one of the ways in which these endeavours found expression. The limit of the SI lies within its strong point: a critique of the commodity that went back to basics without quite reaching the base. The SI both refused and embraced the councilist left. Like Socialisme ou Barbarie, it regarded capital as a management that deprives proletarians of any control over their lives, and concluded that it was necessary to find a social mechanism enabling everyone to take part in the management of life. Socialisme ou Barbarie's theory of "bureaucratic capitalism" gave more importance to bureaucracy than capital. Likewise, the SI's theory of "spectacular society" deemed spectacle as more important to capitalism than capital itself. Debord's last writings actually redefined capitalism as fully integrated spectacle, but the misapprehension had been there since Society of the Spectacle mistook the part for the whole in 1967. There's no contradiction between the Debord and the Vaneigem variants of the SI. Councilism and radical subjectivity both emphasize self-activity, whether it comes from the workers' collective or an individual. "I think all my friends and I would be content to work anonymously in the Ministry of Leisure, for a government that would at long last care about changing life ( . . . )" (Debord, Potlatch, n.29, 1957). It was necessary to expose political action as a separate activity where the individual militates for a cause abstracted from his own life, represses his desires and sacrifices himself to a goal foreign to his feelings and needs. We've all seen examples of a dedication to a group and/or world vision that results in the person's becoming unreceptive to actual events, and unable to perform subversive acts when these are possible. But only the interplay of real relationships can prevent the development of personal weakness and alienated self-denial. On the contrary, the SI called for overall radicality and 24 hour consistency, replacing militant morals with radical morals, which is just as unworkable. The SI's own accounts of its demise after 68 make sad reading: why is it that hardly any member proved equal to the situation? 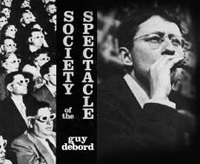 was Guy Debord the only one up to it? Maybe Debord's main fault was to act (and write) as if he could never be at fault. It had been subversive to mock militant false modesty by naming oneself an International, and to turn the spectacle against itself, as in the Strasburg scandal (1967). But the device backfired when situationists tried to use advertising techniques against the advertising system. Their "Stop the Show!" deteriorated into them making a show of themselves, and, finally, showing off. It's not accident that the SI enjoyed quoting Machiavelli and Clausewitz. Indeed, situationists believed that, provided it was performed with insight and style, some strategy would enable a group of smart young men to beat the media at their own game and influence public opinion in a revolutionary way. This alone proves a misunderstanding of spectacular society. Before and in 68, the SI had usually found the right attitude in face of realities which need to be ridiculed before we can revolutionize them: politics, the work ethic, the respect for culture, leftwing good will, and so on. Later, as situationist activity faded, there was not much left but an attitude, and soon not even the right one, as it indulged in self-valorization, council fetishism, a fascination for the hidden side of world affairs, plus mistaken analyses of Italy and Portugal. The SI heralded the coming of revolution. What came had many of the features announced by the SI. The street slogans of Paris in 68 or Bologna in 77 were echoes of articles previously published in the review with a shiny cover. Still, it was not a revolution. The SI claimed that there had been one. Generalized democracy (and above all, workers' democracy) had been the subversive dream of the late 60s-early 70s: instead of perceiving this as the limitation of the period, situationists interpreted it as a vindication of the call for councils. They failed to see that autonomous self-management of factory struggles can only be a means, never a goal in itself nor a principle. Autonomy summed up the spirit of the time: freeing oneself from the systemnot taking it to pieces. A future revolution will be less the aggregation of the proletariat as a bloc, rather a disintegration of what day after day reproduces proletarians as proletarians. This process means getting together and organizing in the workplace, but also transforming the workplace and getting out of it as much as meeting on the shopfloor. Communization would neither take after San Francisco in 1966, nor re-act former factory sit-downs on a much larger scale. The SI ended adding councilism to illusions about a revolutionary savoir-vivre, i.e. a subversive lifestyle. It asked for a world where human activity would be tantamount to constant pleasure, and depicted the end of work as the beginning of infinite fun and joy. It never quite got away from the technicist progressivist view of an automation-induced abundance. 1. Editors Note: See 'What was the USSR? Towards a theory of the deformation of value: Part III: Left communism and the Russian Revolution' p.37 in Aufheben #8, Autumn 1999. 2. Militant has a different meaning in French and English. The word comes from the same origin as "military," and in both languages conveys the idea of fighting for a cause. But in English, it means combative, "aggressively active" (Webster's, 1993). In French, it used to be positive ("militants" were supposed to be dedicated soldiers of the workers' movement), until the SI associated it with self-sacrificing negative devotion to a cause: this is how we use the term here.